pARTicipate Medway is an exhibition by three collectives at Sun Pier House in Chatham. It will inspire you to see the local area afresh. Spectators are invited to participate in installations and to get involved with events; become a contestant in a mock game show, or swap a book in a ‘knowledge exchange’. They aim to question the boundaries, histories and associations of this site and to be inclusive; opening the ‘doors of art’ to the local community. Curated by a group of second year Fine Art students from the University of Kent, each collective has responded to the theme of audience participation, resulting in connected yet diverse exhibitions. Then and Now will enhance your appreciation of this cherishable borough. With paintings made by nursery children from the area, contemporary works from local young budding artists, live music from their resident band ‘Defunk’d’ and Medway’s very own venerable citizens, there will surely be something for everyone to enjoy. The Playground Collaborative invite participants to take part in the creative process by staging a series of playful, humorous and generous scenarios. The opening night sees their space transformed into an underground club setting. The event programme for Tuesday the 19th is packed full of exciting activities, as they look to encourage community, participation and exploration. In the space from 10.15 to 11.15 “A Pile of Stuff” exists representing our lives and the art which may result. This piece of art is a subject of time, influenced by everything that occurs in life. The experience of creation is in your hands as we invite you to explore our playground as a blank canvas. In a society where everything is monetised the balance between value and cost is skewed. “The Playground Book Exchange” (11.45 – 12.45) invites the audience to participate in the exchange of knowledge at no monetary cost. We only ask for the participants to give back something of equal worth. Since we see all knowledge as having the same value it is easily interchangeable. A book for a book. “The ME Show” (13.15 – 14:15) is a video quiz show focused around how society has become subconsciously informed by various mediums. We are asking participants to question their social assumptions made about generational, class and ethnical differences among others. “Beirut” (14:45 – 15:45) continues the theme of participation by holding a training session on how to play the game. In addition to the training there will be personal envelopes prompting action from the audience, testing the limits of their participation. “Cabinet of Habits” (16.00 – 17.00) invites you to follow the path out of the norm, and travel through the uncomfortable zones of human habits and impulses. See inside three different cabinets and test how desensitised by society you really are. 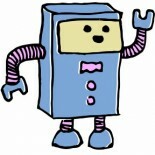 This entry was posted on 08/03/2013 by Creatabot in Creative and Art Events.